McArthurGlen Group is the leading developer, owner and manager of designer outlets in Europe. Presently the Group has 24 designer outlets across the UK, Europe and Canada, housing over 750 brands in more than 2,000 stores and over 600,000 square meters of designer outlet space (Austria, Belgium, Canada, France, Germany, Greece, Italy, The Netherlands, UK). McArthurGlen Centres are home to the most sought-after luxury, designer and high-street brands, internationally and nationally, offering the fashion-loving shopper year-round savings of 30 to 70% on the recommended retail price, all in an attractive and vibrant shopping environment close to major tourist hubs. The Designer Outlet in Roermond was the first Dutch designer outlet of the McArthurGlen Group, which was opened in 2001 and offers a unique brand mix. In Roermond, some 200 brand stores are located in a total area of more than 47,000 square meters of retail space. 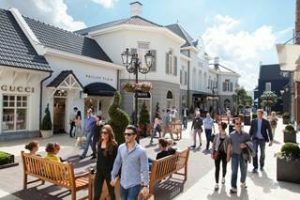 McArthurGlen Designer Outlet Roermond welcomes over 7,8 million visitors every year. Depending on seasonal fluctuations, between 3500 and 3700 employees are operating the Centre. The Senior Marketing Manager is responsible for spearheading the delivery of the Marketing strategy for the Centre including Media, PR, Tourism, Research, Events and Visual executions needed to drive the Centre to the next level. This role will act as lead Marketing Manager for the region setting an example of excellence. As Rudolf van Gompel, McArthurGlen Designer Outlet Roermond General Manager, puts it: “In 2018 we welcomed 8 million visitors, but this will increase to 10 million over the coming 3 years. With this expansion comes the increased need to offer our visitors a differentiating and unique experience. We are looking beyond the traditional retail marketing boundaries and seek to translate our value proposition into a unique user experience, including innovative digital solutions, additional services and entertainment. We are looking to enhance our services to improve on accommodating the needs and interests of new target audiences such as the affluent intercontinental independent traveller, who uses alternative social media tools (e.g. WePay). Recent initiatives include the introduction of the 3 Day Late Night Shopping Experience, the ‘Bringing People Together’-Winter event, Valet Parking and VIP-lounges. Our Senior Marketing Manager plays a pivotal role in the development of the Centre as a whole. We seek an experienced Marketeer who can take our marketing activities to the next level, with special emphasis on user experience and animation”. The Marketing Manager reports to the MAG Designer Outlet Roermond General Manager (Rudolf van Gompel), with a dotted line to the Regional Marketing Manager (Robin Stevens). The ideal candidate is a seasoned retail, fashion brand or leisure&hospitality marketeer. He/she has appr. 15 years of relevant experience, including leading overall marketing initiatives and managing diverse functional marketing teams. He/she has extensive agency experience, either from within or as a client. There are no boundaries when it comes to introducing new and innovative marketing ideas, as such this marketing role is ‘Champions League level’. The ideal candidate has a super high quality mindset and continuously strives for next level performance. He/she enjoys working with excellent and therefore demanding professionals. He/she understands and welcomes the dynamics of multi stakeholder engagement and actively and cleverly finds the right balance between making a stand and embracing centrally agreed upon company actions. Our ideal candidate boasts both experience of having been successful in large corporate environments as well as high speed, action and goal oriented ‘agency mentality’. He/she is ‘cautiously audacious’. In summary, we ar looking for a senior, high talented marketing professional with true marketing passion and multi-channel experience, with excellent communication skills and with well developed emotional intelligence and social agility (no ego issues), capable of multi stakeholder management and a high speed of action mentality.